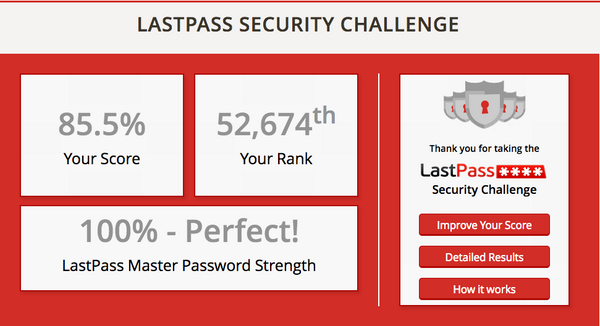 The LastPass Blog: Halfway There! Have You Improved Your Security This Month? Halfway There! Have You Improved Your Security This Month? The past two weeks have quickly passed, and that means we’re now halfway through National Cyber Security Awareness Month. To kick off the month we challenged you to put your passwords to the test by running the LastPass Security Challenge and taking steps to improve your security score. That means generating new passwords to replace weak ones, or trying multifactor authentication, or updating your master password to an even stronger one. Have you made progress? You’ve still got two weeks, let’s see how high you can make your score! Protect all devices that connect to the Internet: Along with computers, your smartphones, gaming systems and other web-enabled devices also need protection from viruses and malware. Plug & scan: USBs and other external devices can be infected by viruses and malware. Use your security software to scan them. Own your online presence: Set the privacy and security settings on websites to your comfort level for information sharing. It’s ok to limit how and with whom you share information. When in doubt, throw it out: Links in email, tweets, posts and online advertising are often the ways cybercriminals compromise your computer. If it looks suspicious, even if you know the source, it’s best to delete or, if appropriate, mark as junk email. Get savvy about WiFi hotspots: Limit the type of business you conduct and adjust the security settings on your device to limit who can access your machine. Protect your $: When banking and shopping, check to be sure the site is security-enabled. Look for web addresses with “HTTPS://,” which means the site takes extra measures to help secure your information. “HTTP://” is not secure. Stay current. Keep pace with new ways to stay safe online. Check trusted websites for the latest information, share with friends, family and colleagues and encourage them to be web wise. Find a downloadable version of the above tips and more great resources at StaySafeOnilne.org.